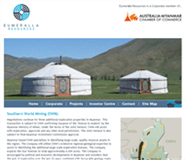 Eumeralla Resources Limited was incorporated on 19th January 2011 for the primary purpose of acquiring and exploring mining projects in Mongolia. The company has recently extended its focus to Myanmar. 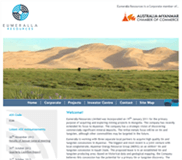 The company has a strategic vision of discovering commercially significant mineral deposits. The initial metals focus will be on tin and tungsten, although other commodities may be targeted in the future. Eumeralla is working with three separate local partners to acquire high quality tin and tungsten concessions in Myanmar. The biggest and most recent is a joint venture with local conglomerate, Myanmar Energy Resource Group (MERG) on an 400km² tin and tungsten concession in Kayah State. The proposed lease is in an established tin and tungsten producing area. Based on historical data and geological mapping, the Company believes this concession has the potential for a primary tin or tungsten discovery. The company understands that if granted, this concession will be one of the largest foreign owned in Myanmar and first under the new mining laws. They await confirmation from the Ministry of Mines and other relevant authorities on the success of the application. Through its wholly owned Singaporean subsidiary, Eumeralla Resources Pte Ltd, the Company acquired all of the issued capital in Centreville LLC (Centreville). 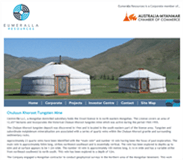 Centreville is a Mongolian incorporated company and holds granted Mongolian minerals exploration license XV-015591 for tungsten and other metals (License). The License is located in north-eastern Mongolia approximately 20 kilometres north of the town of Dashbalbar, 850 kilometres north-east of Ulaanbaatar and 85 kilometres north-west of the Solowevsk-Choibalsan railway. The area forms part of the Dornod-Mongolian steppe region. The License covers 12,657 hectares and encompasses the historical Chuluun Khoroot tungsten mine which was active during the period of 1945-1955. The Company intends to undertake further exploration with the aim of evaluating the tungsten potential of Chuluun Khoroot as well as exploring adjacent areas of mineralisation within the License. 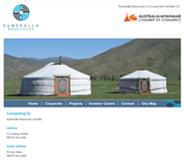 Centreville LLC, a Mongolian domiciled subsidiary holds the Ovoot licence in in north-eastern Mongolian. The License covers an area of 12,657 hectares and incorporates the historical Chuluun Khoroot tungsten mine which was active during the period 1945-1955. The Chuluun Khoroot tungsten deposit was discovered in 1944 and is located in the south-eastern part of the license area. Tungsten and subordinate molybdenum mineralisation are associated with a series of quartz veins within the Chuluun Khoroot granite and surrounding sedimentary rocks. Approximately 23 quartz veins have been identified with the “main vein" and number 18 vein having been the focus of past exploration. The main vein is approximately 500m long, strikes northwest-southeast and is essentially vertical. The vein has been explored to depths up to 60m and at surface appears to be 1-2m wide. The number 18 vein is approximately 100 metres long, 0.14 m wide and has a variable strike from northeast-southwest to north-south. This vein has been explored to a depth of 12m. The Company engaged a Mongolian contractor to conduct geophysical surveys in the Northern area of the Mongolian tenement. This work commenced on the 26 June 2013. The survey will also complete the work program required by the Mongolian government. In September 2013, the Mineral Resource Authority granted an extension of the licence for an additional three years until 26 September 2016. In July 2013, the Company, in conjunction with a local partner, Myanmar Energy Resources Group (MERG) jointly applied to Myanmar Government's Ministry of Mines for an exploration lease of approximately 400km² in Kayah State, Myanmar. They await confirmation from the Ministry of Mines and other relevant authorities for confirmation. The application is the important first step in gaining an exploration licence and has been submitted on the basis of: the Company – 70%; MERG – 30%. The Joint Venture is currently awaiting approvals from the Ministry of Mines and local government for the granting of this strategic lease area. Once approved, final sign off by the Myanmar Investment Commission is required to confirm the joint venture's interest in the exploration lease. The proposed lease is in the established tin and tungsten producing area Kayah State. Based on historical data and geological mapping, the Company believes this concession has the potential for a primary tin or tungsten discovery. 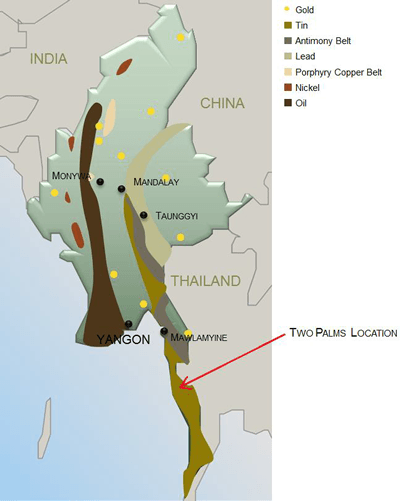 Negotiations continue for three additional exploration properties in Myanmar. This transaction is subject to SWM confirming issuance of the 'licence to explore' by the Myanmar Ministry of Mines. Under the terms of the Joint Venture, SWM will assist with exploration, approvals and any other local permissions. The Joint Venture is also subject to final Myanmar Investment Commission approval. Myanmar based SWM specialises in identifying large-scale, quality resource assets in the region. The Company will utilise SWM's extensive regional geological expertise to assist in identifying the additional large-scale exploration licenses. The Company expects the four licenses to total approximately 4,000 acres. The Company is encouraged by political and economic developments in Myanmar and considers that the lack of exploration over the last 30 years combined with favourable geology make the country highly prospective for tin and tungsten. The Company continues to conduct legal and geological due diligence of several sites in Myanmar with the view to increasing its footprint in the region short term. 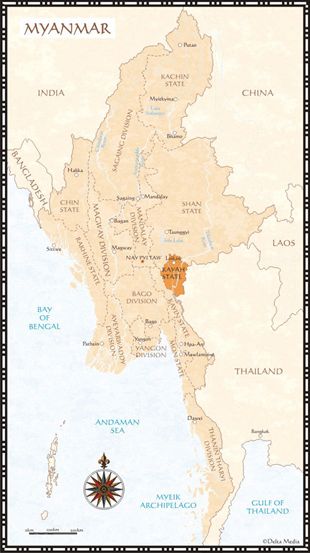 The Southern regions of Myanmar include areas belonging to the South East Asian tin belt which includes parts of Indonesia, Malaysia and Thailand which produces tin and tungsten. 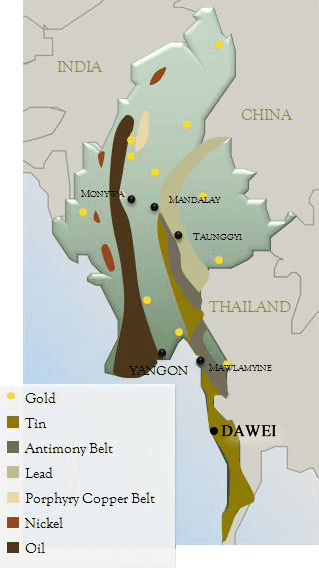 The area around the port city of Dawei is the major focus of exploration. The Company signed a Memorandum of Understanding with Two Palms in December 2012 for exploration which is subject to Ministry of Mines approval. One potential exploration site has been identified. The company is currently working on establishing a joint venture structure required under Myanmar law to unsure the formal issuance of the licence application. The proposed Joint Venture has been working to identify three additional deposits as per the agreement with Two Palms. The Joint Venture is close to selection of these additional sites and the company looks forward to updating the market once finalised.